Remote hideaway nestled along the banks of Ping River in Chiang Mai, just perfect for you to relax, recharge and restore your sense of well-being. Time rushes by and life becomes ever more hectic. The world appears to be spinning ever faster into the future. A life among antiques, however, can slow things down, making us stop and contemplate the beauty of old workmanship and artistry and its history. At The Marndadee Heritage, each room is uniquely designed with its own story to tell. Elements are inspired by traditional Lanna, Sino and Colonial style. Take time to pamper yourself with various spa treatments, and restore your sense of well-being with our complimentary yoga class and guided morning walk. Want to feel totally renewed? Join our MIND, BODY & SOUL retreat programs. Varied cuisines from traditional Thai at HOHM RESTAURANT to modern-chic brunch at PLOEN CAFE. Indulge in sweeping views of nature that surrounds when you dine with us. Discover a range of activities during your stay at The Marndadee Heritage. Experiences offered include Muay Thai, Rice Transplantation & Harvesting, Thai Cooking Class, Yoga, and Meditation. 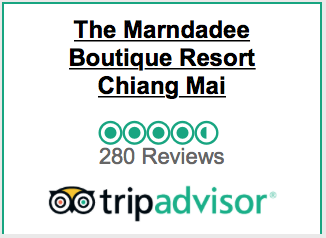 At The Marndadee Heritage Chiang Mai, 80 percent of the furnishings and décor are antiques, distinguishing every room with an individual touch. A cupboard once owned by a British resident of Burma, a bed of British origin that came from India and a sofa from Germany are just a few of the examples of the eclectic collection of the resort’s furniture. Receive a complimentary fifth night.